The Vanguard Cadets held their Monday night lead and took home the gold at the 2015 Open Class World Championship Finals on Tuesday, August 4. “Tonight the show was just really focused. We nailed every single thing that we had and we gave it our all and it really paid off,” Vanguard Cadets Drum Major Carl Huang said. 2014’s Open Class Champions, Blue Devils B (2nd, 80.325), were unable to pull ahead for a repeat, but according to drum major Albert Lin, the corps members aren't discouraged. Spartans held their third place finish from the World Championship Prelims competition on Monday, this time earning a score of 76.025. "They did a great job, and they’ve been getting stronger all week long,” Spartans director Richard Rigolini said. The corps' dedication to its 2015 program, "At the Gates," helped the Spartans rise this season, says Rigolini. Genesis finished in fourth place with a score of 75.750. Drum major John Fillipone has been especially proud of this year's corps. Legends landed a fifth-place finish with a score of 75.125. 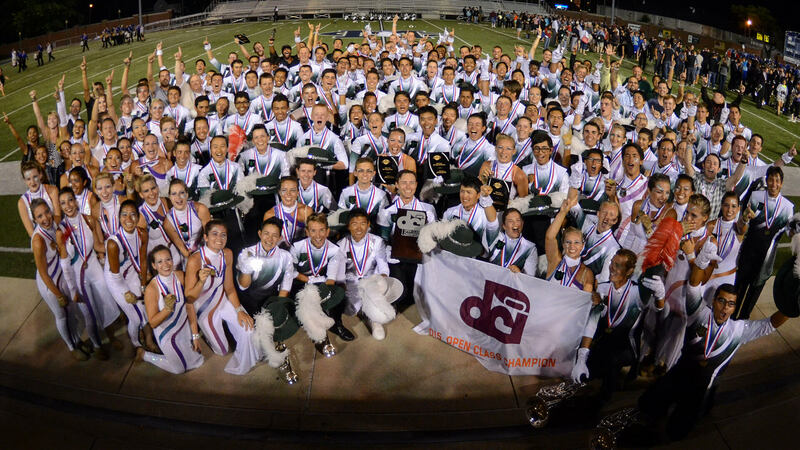 With their 10th anniversary production, “The Climb,” the corps was named the 2015 Most Improved Open Class corps, complimenting their most successful season on record. "We knew we were capable of having our best drum corps season ever, and I don't think the membership knew they had the capability of knocking on the doors of the top groups this year,” Legends director Ibe Sodawalla said. “To be in some competitive fights was quite exhilarating, and it made us and our game much stronger." 7th Regiment took home sixth place, earning a score of 74.875 with its show "The Labyrinth." According to Drum Major Dalton Gyorda, the corps from Connecticut has grown significantly in recent years. Following 7th Regiment, Music City finished its season in seventh place with a score of 71.125. "We knew from the start that we had potential to max out this show. It’s awesome to see all of our hard work starting to pay off at the end of the season," Drum Major Claire Albrecht said. Gold followed the Nashville corps, jumping from 9th place during Monday’s Prelims into 8th place with a score of 67.725. First year Open Class corps River City Rhythm took ninth place with a score of 67.425. Director Todd Dufault says the corps put all of their effort into making a great performance and earning a spot in the Open Class Finals has surpassed many of the expectations they had earlier in the season. "With all the uncertainty of a first-year corps, I cannot be more proud of the kids and all they’ve accomplished this first year," Dufault said. Colts Cadets held their 10th place position from Monday night with a score of 64.100. "Our performance was really solid. There was good feedback from the crowd and a lot of the tempo tears we’ve had normally weren’t there,” Colt Cadets drum major Abbey Beacom said. In their 25th anniversary season, Raiders placed 11th with a score of 63.600. "I believe our performance went really, really well. It was the best one of our season," Raiders drum major Bridgette Lysaght said. With their 2015 show, “From The Ashes,” Raiders reflect on the corps’ past and look into their hopeful future by following the life of the phoenix. “It’s really brought us together as a family. We’ve really come close together trying to project the story of the phoenix in ourselves for the anniversary,” Lysaght said. Les Stentors took home 12th place with score of 60.250. The corps from Quebec included 20 first-time marchers this season, requiring extra effort and creative thinking when putting their show together. Three international corps opened the second night at Ames Field, with Jubal taking home the gold with a score of 68.450. Hailing from the Netherlands, the corps still has more than a month left in the European competition season. Gita Surosowan Banten (2nd, 66.200) traveled all the way from Indonesia to tell the story of the Banten Empire with their performance of “Sound of Surosowan.” The corps has been rehearsing together for six months and is comprised of members between the ages of 12 and 17. “This is the first time for our band in America. We’re very happy to perform for America and hopefully every year we can come here,” corps director Joko Sucasyono said. Rounding out the International Class competition, Chien Kuo High School placed third with a score of 64.825. After just eight days in the United States, director Damien Fan is pleased with the group’s first performances on American soil. “DCI is like the NBA of the marching music activity, so I think it’s always a good thing to open our horizons and really aspire to a new level,” Fan said. Their performance of “Void” follows an adventure through the universe. Fan believes the exploratory nature of their show is enlightening to young people, and he’s optimistic that it will inspire more young people to join drum corps activities in the future. “Hopefully this will also help the activity grow back in Taiwan and bring the band to a new level,” Fan said. All Open and International Class corps will have the chance to perform again at the 2015 World Championship Prelim on Thursday, August 6, at Lucas Oil Stadium in Indianapolis. View the lineup and performance order for the DCI World Championship Prelims, Thursday in Indianapolis.